One electronically tested 14KT yellow gold ladies cast ruby and diamond ring with a bright and milgrain finish. Condition is new, good workmanship. The featured ruby is set within a ruby and diamond floral bezel, completed by a two and one-half millimeter wide band. Identified with markings of "K14". 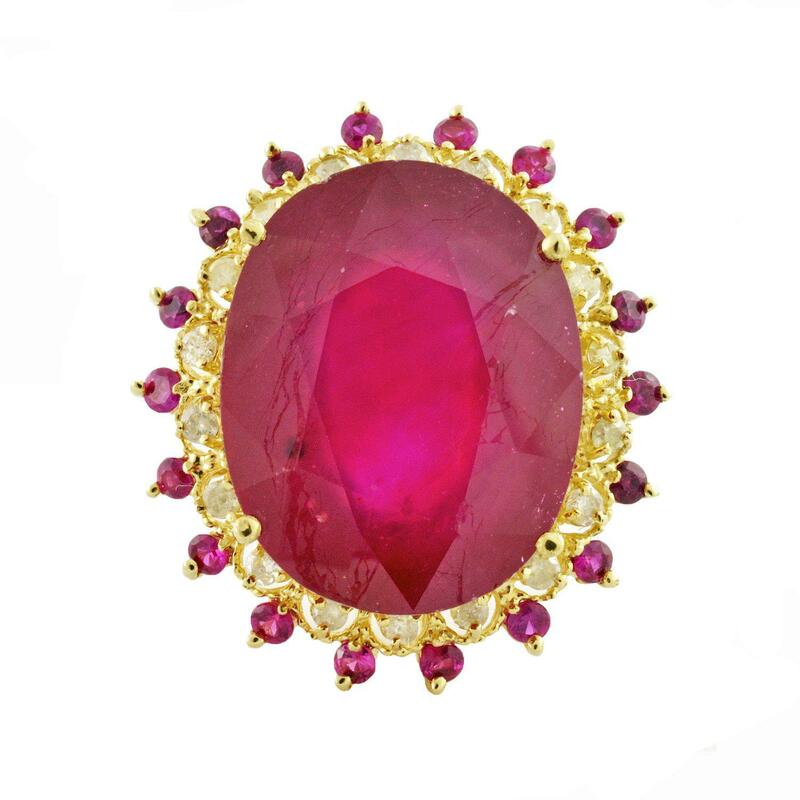 One prong set oval mixed cut natural ruby, measuring 15.05 x 12.70 x 7.80mm, approximate weight of 14.33ct., clarity is heavily included, type II, medium dark, moderately strong, slightly purplish red color, (GIA slpR 6/4), cut is good. Transmitting light somewhat diffusely, transparent to translucent. Naturally occurring internal & external characteristics are present. Indications of laboratory high temperature heat treatment, with glass & flux additives. Graded in the setting. Sixteen prong set round brilliant cut natural rubies, measuring 2.00 - 1.90 x 1.27mm, approximate total weight of 0.67ct., clarity is slightly included, type II, medium dark, moderately strong, slightly purplish red color, (GIA slpR 6/4), cut is good. Transmitting light with a minimum of distortion, transparent. Naturally occurring internal & external characteristics are present. Indications of laboratory high temperature heat treatment, with flux residue. Graded in the setting. Ruby has a low tolerance to rhodium plating, repolishing the surface, & ultrasonic cleaning. Sixteen prong set round brilliant cut diamonds, measuring 1.70 - 1.60 x 0.99mm (depth est.) approximate total weight of 16 Stones = 0.34ct. Graded in the setting.